'''JMC Yusheng (江鈴馭勝/江铃驭胜) (N350). 2010 to date (prod. n/a). 5-door SUV. F/R, F/A, 1997, 1999, 2378 cm³ petrol, 2402 cm³ diesel (I4 DOHC).''' Mid-sized SUV from commercial manufacturer and [[Ford]] affiliate, which had made [[Isuzu]]-based trucks in earlier years. Débuted a new logo for JMC, separating Yusheng from its truck line. Facelift in 2013, with S350 designation. Two-litre Ford Ecoboost petrol engine, developing 151 kW, announced in 2015, replacing earlier [[Mitsubishi]] 4G63T two-litre. '''JMC Yusheng (江鈴馭勝/江铃驭胜) (N350). 2010 to date (prod. n/a). 5-door SUV. F/R, F/A, 1997, 1999, 2378 cm³ petrol, 2402 cm³ diesel (I4 DOHC).''' Mid-sized SUV from commercial manufacturer and [[Ford]] affiliate, which had made [[Isuzu]]-based trucks in earlier years. Débuted a new logo for JMC, separating Yusheng from its truck line. Facelift in 2013, and renamed Yusheng S350, when JMC spun off the model name into a marque. Two-litre Ford Ecoboost petrol engine, developing 151 kW, announced in 2015, replacing earlier [[Mitsubishi]] 4G63T two-litre. JMC Yusheng (江鈴馭勝/江铃驭胜) (N350). 2010 to date (prod. n/a). 5-door SUV. F/R, F/A, 1997, 1999, 2378 cm³ petrol, 2402 cm³ diesel (I4 DOHC). 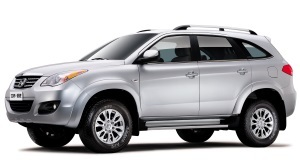 Mid-sized SUV from commercial manufacturer and Ford affiliate, which had made Isuzu-based trucks in earlier years. Débuted a new logo for JMC, separating Yusheng from its truck line. Facelift in 2013, and renamed Yusheng S350, when JMC spun off the model name into a marque. Two-litre Ford Ecoboost petrol engine, developing 151 kW, announced in 2015, replacing earlier Mitsubishi 4G63T two-litre.